“Hired: six months undercover in low-wage Britain” paints a vivid picture of life in some of the toughest corners of the world of work. It also – as Angus Hanton, Co-founder of IF, reports – raises issues of intergenerational fairness To find out what it’s like to be a poor and downtrodden worker, James Bloodworth put himself in exactly that position: he went to work in four of the lowest paid jobs in the British economy. James Bloodworth worked for Amazon in a picking and packing warehouse in Rugeley, took a job as a care worker in Blackpool, moved on to a call-centre for an insurance company in South Wales and then worked as an Uber driver in London. He immersed himself in the hand-to-mouth existence of this work and explains the practical hardships he came up against: finding the deposit to rent an expensive and overcrowded flat, getting the necessary paperwork to prove he didn’t have a criminal record, and living on almost nothing for the first few weeks before getting his end-of-month pay. Even there the agencies often push workers into the hands of loan sharks by under-paying and blaming poor administration. “Hired” takes us around Britain to areas where subsistence jobs have replaced once-thriving industries. At every stage you feel the pressure on his time – finding time to get the required work done, needing to work long hours to earn enough to survive, and then barely snatching enough time for food shopping and getting enough sleep. There is virtually no possibility of saving, so most of his fellow workers don’t have any cash reserves for when they get ill or things go wrong, they can’t save for holidays, and saving towards buying a home or building up a pension is practically unthinkable. It’s clear that this work is dominated by immigrants and young people, so James Bloodworth was seen as slightly suspicious by a few of his new colleagues: they quickly recognised him as middle-class and too old to be doing such low-paid work. Young people working in those sectors that Bloodworth explores face practical problems that are rarely noticed by older professionals: long and expensive journeys to work, the unaffordability of healthy food, and the near impossibility of finding a time when dentists and doctors can be visited. He relates the physical exhaustion and blisters he gets from working in a warehouse where he walked on average 14 miles a day, and – at the other extreme – the sedentary and tedious life of a call centre where taking exercise is totally impractical. James Bloodworth’s background as a journalist makes him a natural networker and he meets people in other lines of low-paid work such as Deliveroo workers who lose their income when they get injured and face huge pressure to work long hours in dangerous conditions. Bloodworth tries to find ways to improve these miserable working conditions. He looks at unionisation, but that is very difficult because Eastern European workers are often transient, and agencies deliberately move people on within a few months to prevent them getting full employment rights. The first stage of making change is to tell everyone of the conditions of low-paid workers – and “Hired” is a conscious effort to raise awareness. What is so frustrating is that many of the difficulties that low-paid workers face are simply a result of incompetence and thoughtlessness – the bureaucratic delays in responding to requests for paperwork, the pressure on care workers to make their visits very short, and the failure of companies to cope with very seasonal demand. 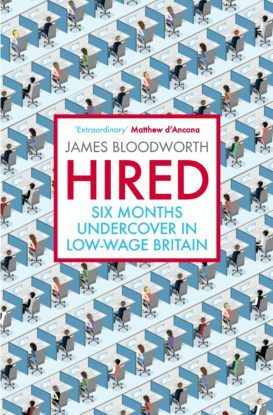 James Bloodworth (2018): Hired: six months undercover in low-wage Britain, Atlantic Books, London. ISBN-13: 978-1786490148. Paperback, 288pp, RRP £12.99.